If you didn’t get your fill of sweets yesterday I have just what you need today! 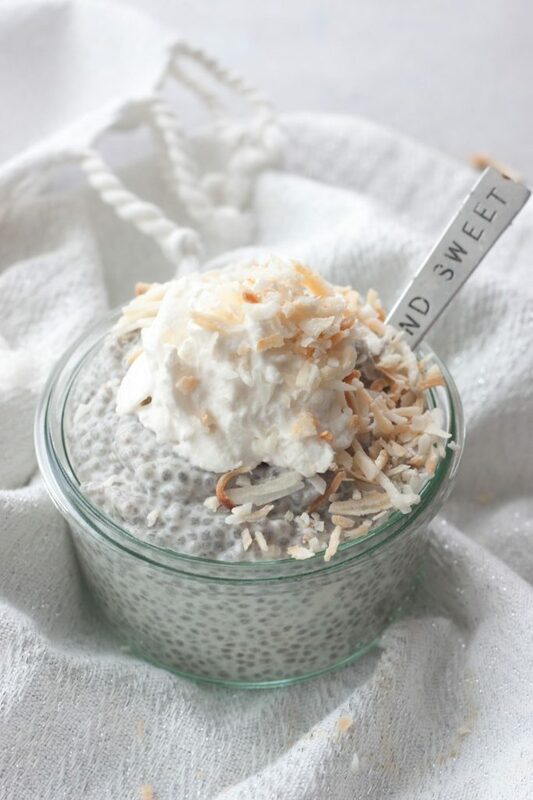 Although it isn’t nearly as sweet this Coconut Cream Pie Chia Pudding is delicious. Not to mention healthy and will keep you full! Can’t argue with that. Especially if you decide to enjoy it for breakfast, yes I just said dessert for breakfast! Chia pudding is so versatile and so easy to make. S, my oldest, is my chia girl and loves it probably more than I do which is a little crazy. A isn’t as big of a fan and I have to blend hers as she isn’t a fan of the texture. To me it brings back the memories of tapioca pudding cups I use to eay with my grandpa. I use to tell my brother they were fish eggs! Haha. While I like it for dessert I really like it for breakfast. It’s so easy to make the night before and have ready for a grab and go breakfast. I can throw a jar of it in my cup holder and eat it while dropping the girls off at school and it keeps me full. The options are endless and I usually go with something simple with protein powder, peanut butter, chocolate, or a classic favorite bananas. If it isn’t one of those than it’s a flavor combo inspired by my favorite desserts, like this one! I’m not a big pie person, mainly because I don’t like the crust, but I love a good coconut cream pie! Not one that is all cream but one that is packed with coconut! My dad and I love coconut cream pie and there is a store that has an amazing coconut cream pie here! Of course whipped cream and dairy never agreed with my tummy I wouldn’t care when it came to this pie. I was thinking about the pie recently, maybe because my dad’s birthday is right around the corner, and I had to whip up a creamy coconut cream pie chia pudding! One that was full of coconut and creamy coconut cream! So creamy and delicious it hit the spot! 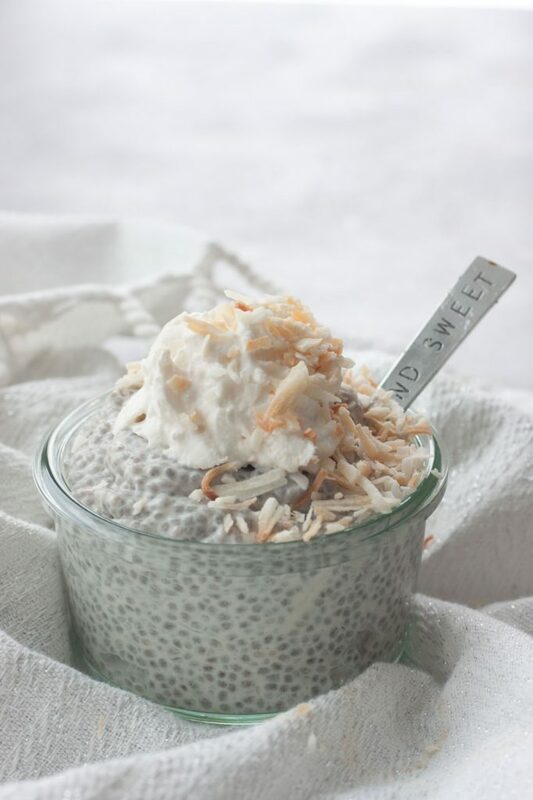 As if a delicious dessert inspired breakfast, or snack, or you can enjoy it for dessert isn’t enough for you I can tell you all the healthy reasons why it’s a good, I mean great, idea to whip this Coconut Cream Pie Chia Pudding up! Start with the healthy full fat coconut milk. Aside from the fact that it, as well as the chia seeds, will keep you full it’s a high in fiber and a rich source of B vitamins, vitamin C, vitamin E and the essential minerals iron, selenium, sodium, calcium, magnesium and phosphorus. The MCTs, medium-chain fatty acid in coconut cream and coconut oil are said to have many health benefits and aid in speeding up the metabolism. Chia Seeds are loaded with omega fats, protein, antioxidants and fiber. They are a great source of healthy essential fatty acids, eight times more than salmon! They’re also one of the most digestible plant proteins. Chia is the Maya word for strength, which I just found out, and it’s so fitting. I use a little maple syrup which I like because it has magnesium, but really I don’t use much so it’s more that it’s a natural sweetener and I like the flavor it adds. Otherwise stevia is my go to for a sweetener in this chia pudding. If I am making it for dessert I also like to add a little Coco Whip coconut whipped cream! 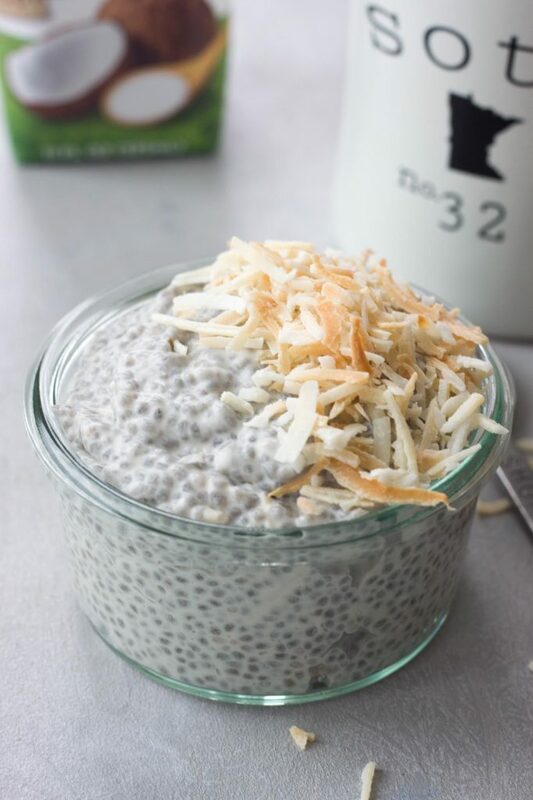 If that isn’t enough of a reason to enjoy this dessert inspired Coconut Cream Pie Chia Pudding for breakfast, or anytime, I don’t know what is. I guess that just leaves more for me! Haha! If coconut isn’t your thing check out these 3 delicious simple favorites! *Toast your own coconut by preheating oven to 350F. Spread coconut out on a rimmed baking sheet and place in the oven watching closely and mixing once after a couple minutes. It will only take a few minutes to brown so watch closely. In a jar or container mix together coconut milks, chia seeds, vanilla, maple syrup, and 1 tablespoon of the toasted coconut. Cover and refrigerate at least 2-3 hours or overnight, stir in optional add-ins and or more liquid to reach desired consistency, top with remaining toasted coconut (and optional Coco Whip if enjoying for dessert) Enjoy! 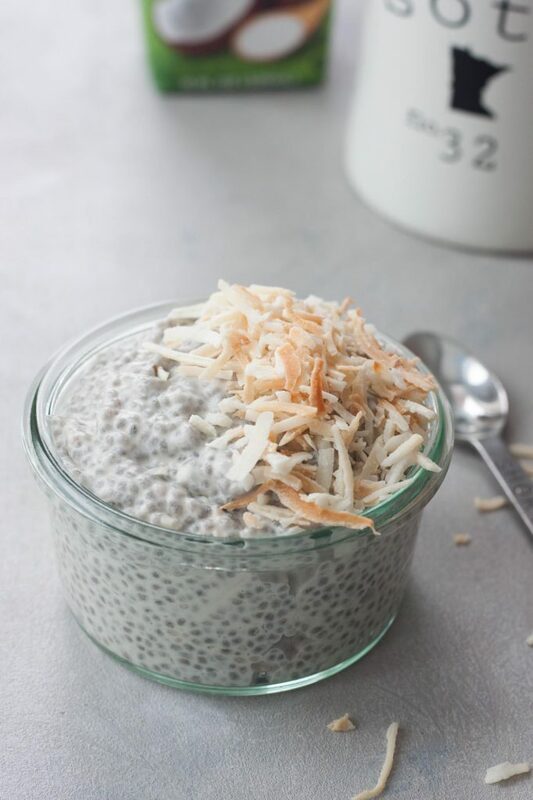 Delicious Coconut Cream Pie Chia Pudding is healthy enough for breakfast or dessert! Dairy free, vegan, and paleo it’s a great way to start or end the day! If it’s the texture try blending it and it turns into a creamy pudding! I have to do this for A’s. Thank you. Hope you love it as much as I do! Oh yum! This looks so creamy and indulgent. I definitely like coconut so I appreciate treats that embrace rather than mask it! This fully embraces it down to the toasted coconut and the flavor it adds. I know the feeling, I could eat this any time of day too my friend! I go in phases and when I make it again I’m reminded how much I love it! I still haven’t had chia pudding yet! I need to change that!! Looks so tasty and coconut is totally my jam. Makes me think of the tropics. Really? Yes I think you need to give it a try! I have a bag of chia seeds just waiting to be used in this recipe! I bet my kids would love it too! I hope your kids love it, if they like coconut they will. My girls love banana, peanut butter, cacao, ect. I just have to blend it smooth for my youngest, my oldest is obsessed with chia. This sounds amazing!! I love how simple the ingredient list is too. I will have to make this for my husband – coconut cream anything is his favourite. Thank you. I hope he loves it, keep me posted! I know I’m completely late to the party, but I haven’t tried chia pudding yet! This one looks amazing though. I’m hearing a lot of this and we’ve been eating it for years so I’m surprised. I hope you give it a try soon! Now you have me craving chia pudding. Looks delish! Now you have me craving chia pudding! Looks so good! I love coconut cream pie – this sounds like a nice treat without as much guilt. Chia seed are extremely healthy! I would love to have this for breakfast. Great recipe, Sarah!